Who knew? It’s National Reading Group Month! 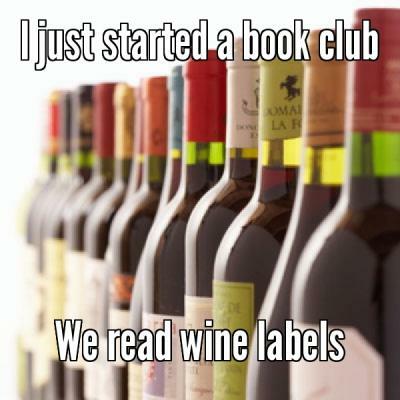 I highly endorse joining a book club. They come in all shapes, sizes, and levels of association. Despite some common misconceptions, these meetings aren’t a chore, or a chance to show off your book knowledge or deal with other show-offs. What it really comes down to is finding a group of people you can talk books with. Cos that’s a gorgeous feeling. I am officially part of one book club, but I have dabbled in others as the mood strikes me. My official one is technically an alumni group: graduates from the Boston University Core Curriculum–members of a group aptly named EnCore–meet in the Core Office on BU campus the first Wednesday of every month to eat (free) pizza, pour libations, and gab about the month’s pick. November 2014’s choice, for example, will be Angela Carter’s Nights at the Circus. Previous picks have been as diverse as Elizabeth Pisani’s The Wisdom of Whores, Henry James’ Portrait of a Lady, and J.R.R. Tolkien’s The Hobbit. One time, I felt like emulating the film The Jane Austen Book Club (2007), and joined some friends to discuss Sense and Sensibility. Unfortunately, the spontaneous nature of that meeting meant some of the members didn’t get around to, you know, reading the book. So we watched the film instead. Meh, some meetings will be more substantial than others; that’s just how it goes. Check out your local bookstore or library; many offer book clubs that you can join and leave whenever you wish (for example: the Brookline Booksmith and the Harvard Bookstore both have groups). 1. It’s not school, so don’t be petrified and think you have to read the whole book and have a ton to contribute. 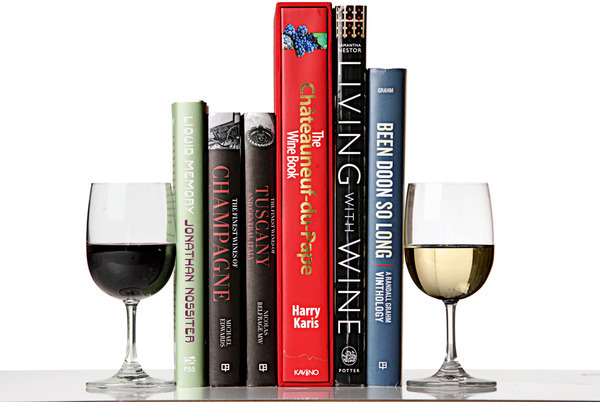 Most book clubs have a welcoming, friendly, and laid-back environment. That being said, it’s more fun when you bring and voice your own opinions to widen the perspectives of others. 2. That being said, don’t be a blowhard. Everyone has thoughts, and though I’m sure yours are unique and amazing and groundbreaking, etc., an “OhMyGodWhyWon’tThatGuyShutUpSoICanMakeMyPoint? ?” attitude is tiresome. Be considerate. 4. Don’t be mad if you haven’t read the book and there are spoilers at the meeting. Spoilers are allowed. 5. 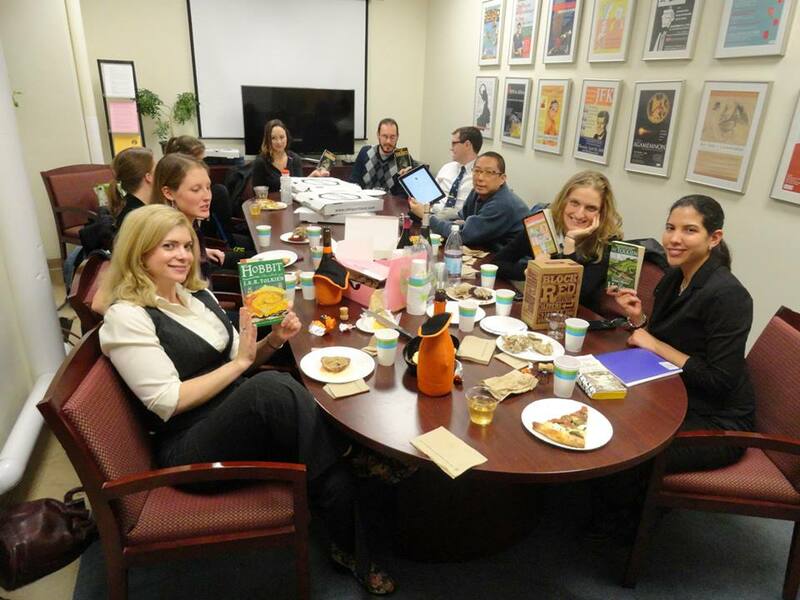 Though some book clubs meet in public spaces where victuals are not allowed, if you are in a home or sanctioned location, bring food and drink! It adds flavor and heightens emotions in a useful way. Booze is very fun. That being said, don’t be a booze hound: it may lead to scenes or confrontations you would wish to avoid. 6. If you are an author, don’t secretly attend book clubs where your book is under discussion. That’s just weird. Check out the perspective of an author who did just that. You’ve been warned. I hope these tips were helpful! Go out, and find like-minded individuals to talk lit with. If you ever want to chat lit with me, feel free to leave a comment: I’m always game. 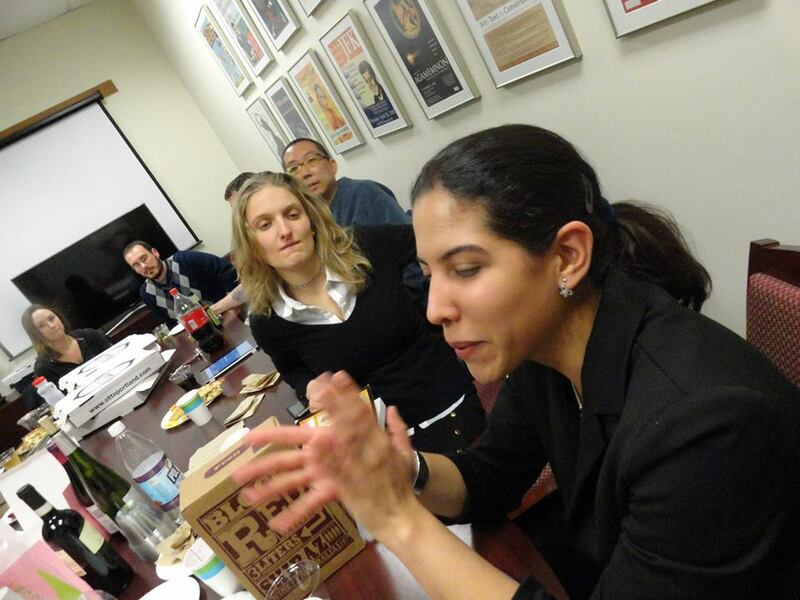 Note the OTTO’s pizza and booze that fuels EnCore’s thoughtful discussion. This entry was posted in Literature and tagged Brookline Booksmith, BU Core Curriculum, EnCore, Harvard Bookstore, National Reading Group Month. Bookmark the permalink.